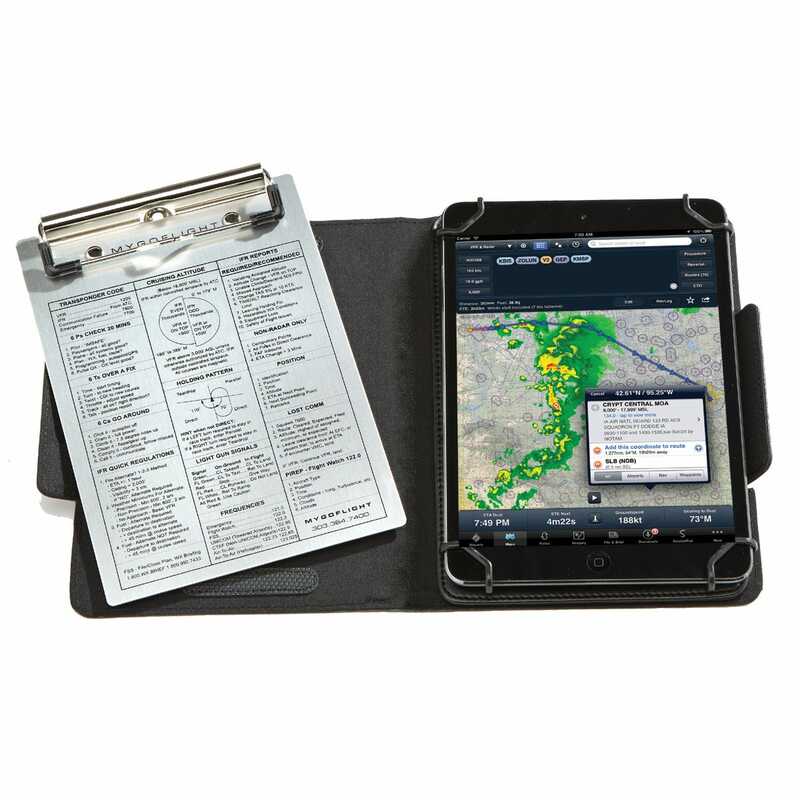 MyGoFlight's innovative Folio C Kneeboard is a versatile and stylish way to secure your iPad in the cockpit and organize all your gear. 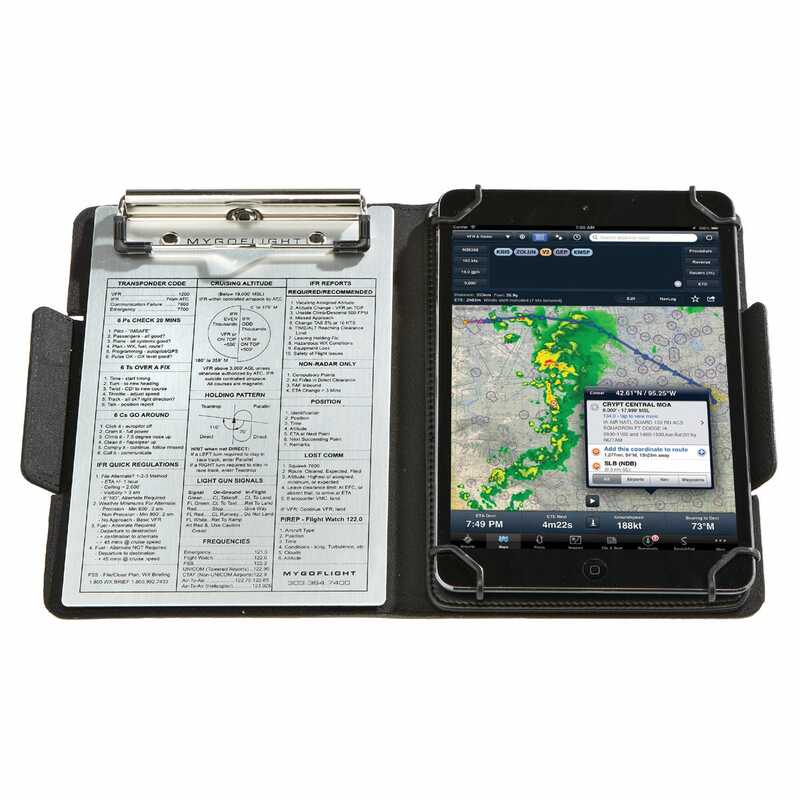 Made from high quality leather, it's really three products in one: a rotating iPad kneeboard, a metal clipboard and an everyday case. 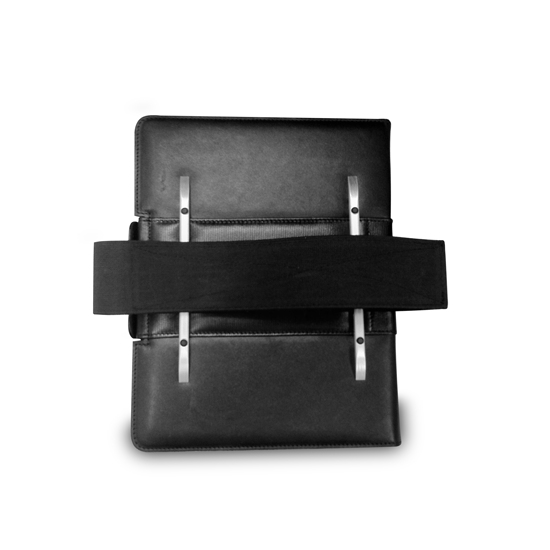 Soft, rich leather wraps the outside while a protective microfiber material lines the inside. The iPad is held by a sturdy plastic clips on each corner. All of the ports and controls remain accessible so the iPad can be charged, synced and controlled when it is in its case. The clipboard is held in place by magnets, so it's easy to move from the front of the Folio C to the left side panel. You won't scratch your iPad screen. The Folio C was designed for the demanding and exacting needs of pilots and the cockpit environment, and available for all. It is designed to accommodate all preferences for how you like to use it - both right and left hand, attached to the right or left leg, as a traditional kneeboard with the clipboard on the outside or as a lap desk. 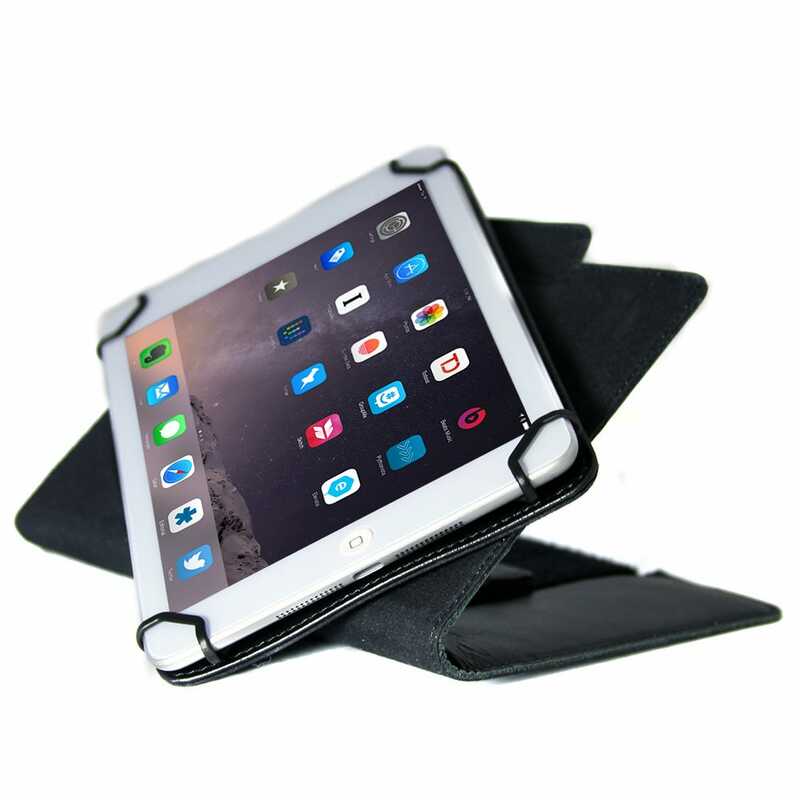 The cover can be wrapped fully around the case so that only the iPad is available on your leg for those cockpits or spaces that have minimal space. 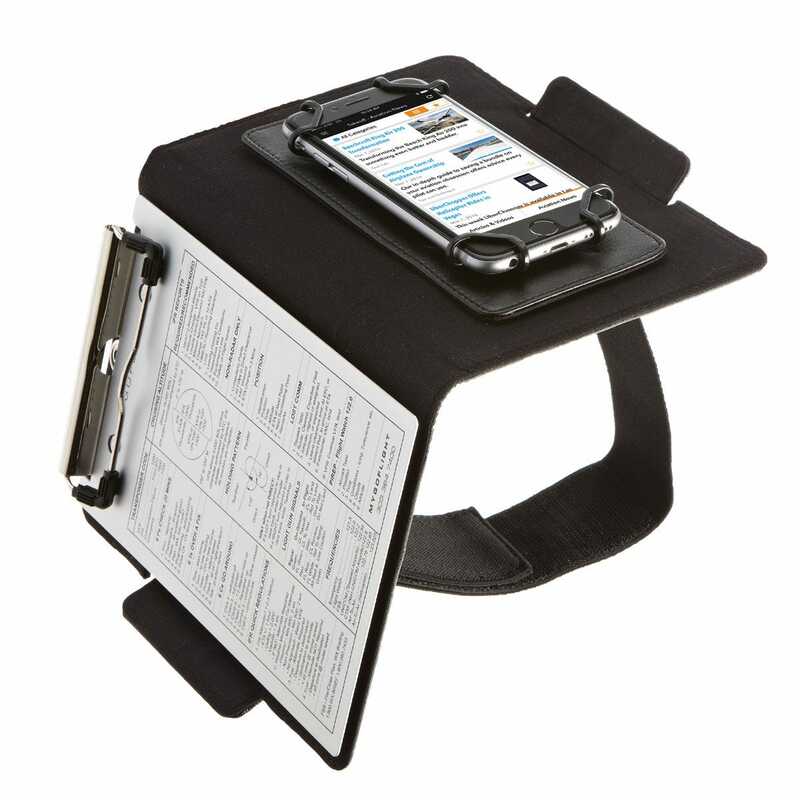 The built-in stand feature enables you to prop your iPad at almost any angle on a table or other flat surface. A low slant is perfect for reducing wrist strain while typing on the iPad on-screen keyboard. A higher angle gives you a perfect position for watching movies or photo slideshows or when typing with a wireless keyboard. 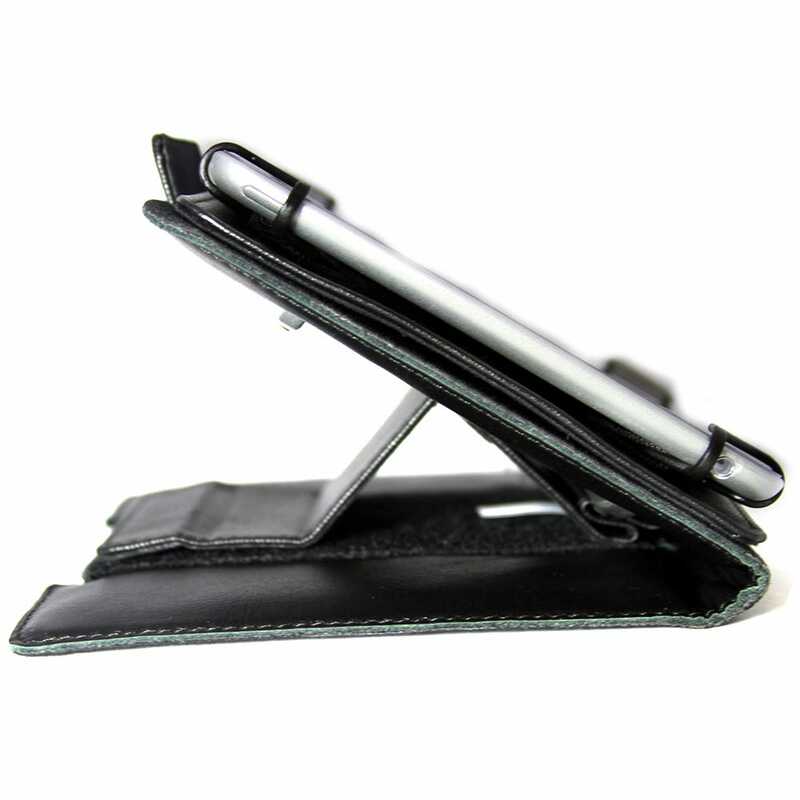 When the stand is not needed it stores neatly against the case and turns into the case's closure system. 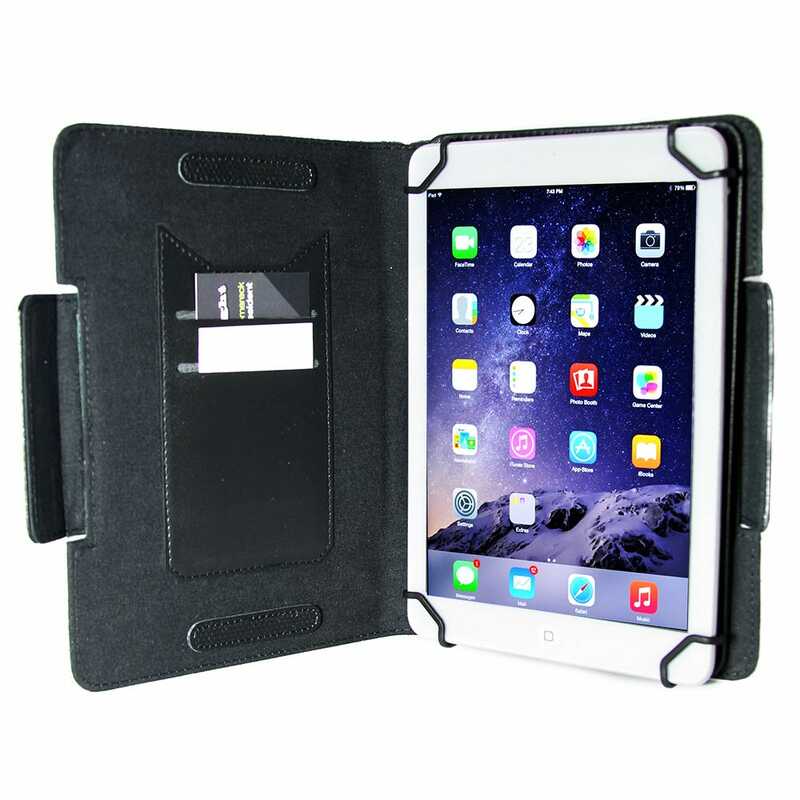 This keeps the front of the case closed and your iPad screen is protected when not in use. 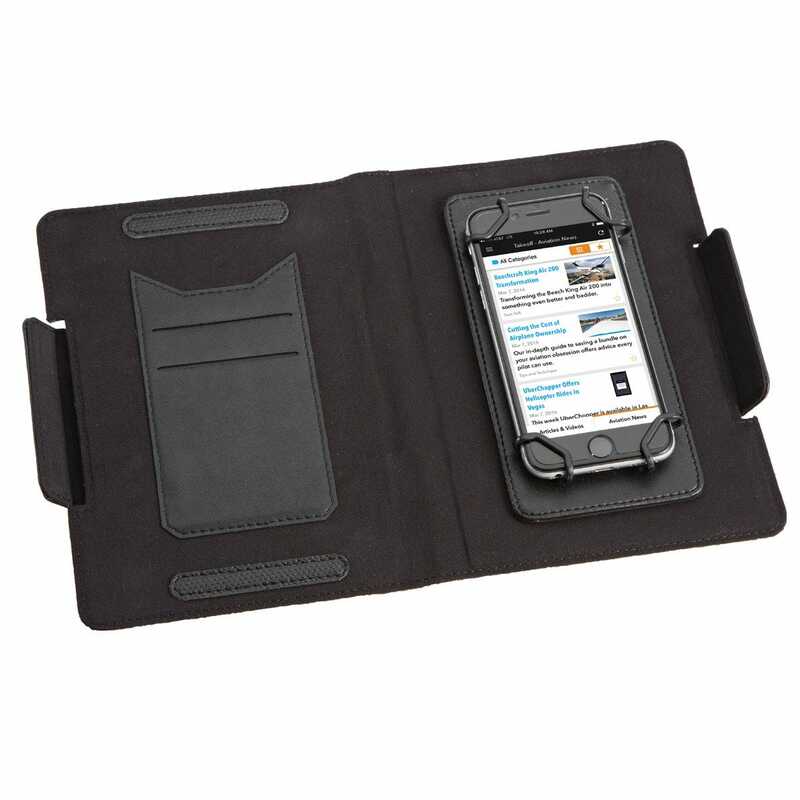 Remove the strap and you have a professional every day case to hold and use your iPad. 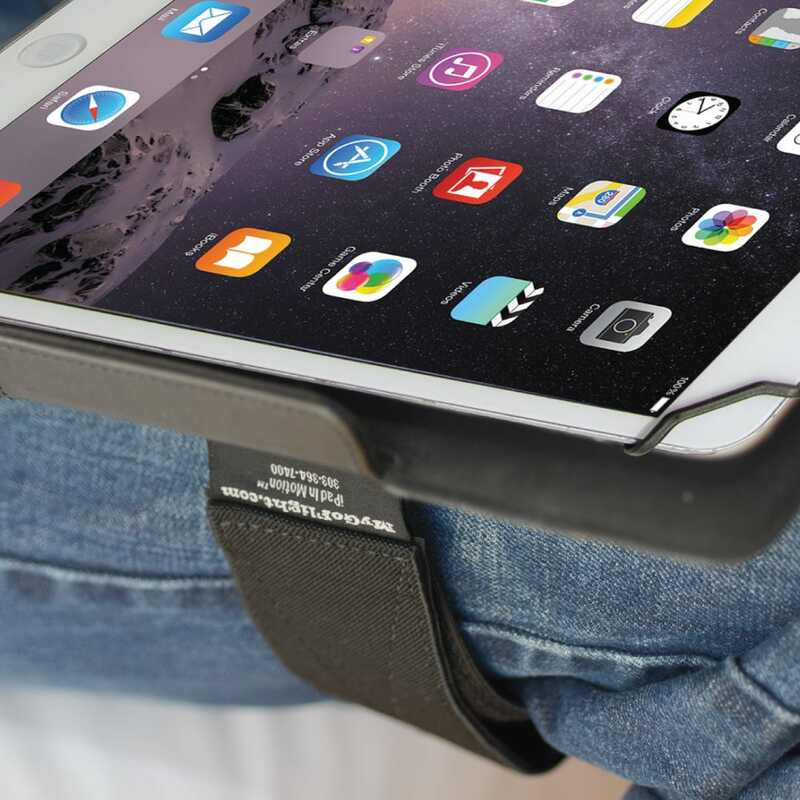 This kneeboard is designed to secure your iPad without a case on the iPad. Some very thin cases will work but are not needed/recommended. 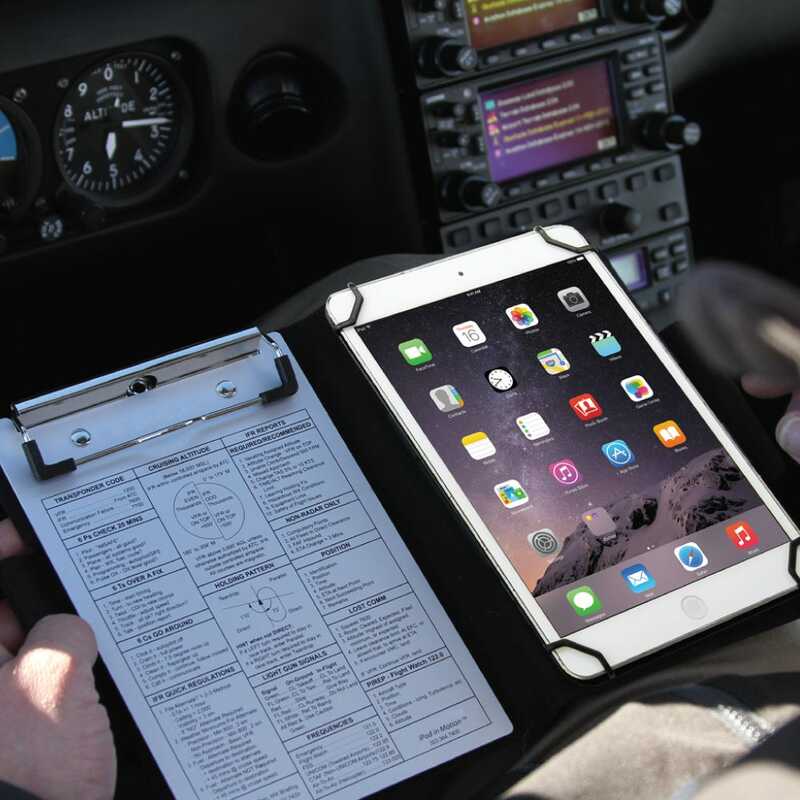 The iPad Air 1-2, iPad 2017, and the newest 9.7" Pro will all fit in the same kneeboard. Some Android tablets with similar dimensions will work too. This kneeboard is also compatible with the New iPad Pro 10.5" and iPad Air 2019 but it is a snug fit. All iPad Mini versions from 1 - 5 will work with the same kneeboard. Some Android tablets with similar dimensions will work too. For the larger than life iPad Pro 12.9" users. This kneeboard will be compatable with the small table you call an iPad. This will work with iPhone 6, 6S, 7, 6+, 6S+ and 7+. Really like the fit when it’s open in lap. The clipboard needs to slide up a little to fold well with the iPad in place. Would love to see a pen holder in the crease perhaps, that I could use easily with one hand. It’s a little on the $$$ side but it’s well made and fits my needs. Especially since Sporty's markets far less expensive other brands. the only way to secure the clipboard on the outside is too put the locking flap over it. The clipboard magnets aren't strong enough to hold it on their own. You'll read many comments about the clipboard falling off of the front. These comments are accurate and when I got mine it had a sticker on it saying the clipboard secures to the inside of the case (no mention of the front). Problem is that their own description and video lead you to believe both. This is not true though and it does stay on the front empty, but barely and not when tilted. They could easily add magnets to it. The paper that it comes with shows it somehow titled but not in an illustration that shows how to do it. I have yet to see how, even having played with it for some time. Instructions how to accomplish this would be nice. The clipboard is very small also. Not a con really but I was surprised at it's size. For the price there should be a simple pen holder. Even a loop on the side or top front, or maybe on the clipboard. A major bonus would be to have two or three so one could be for a stylus and one for a backup pen. Added magnets (or stronger ones) with pen holders would make this product perfect. Despite the cons it is a high quality product. The leather is great and the mechanism for the spin seems top notch. I own the larger of them for the 12.9 ipad. It's perfectly sized without giving too much over what it will need. Love it. It is a bit bulky, but overall this is a very nice kneeboard. I'm able to easily use my iPad as well as the hard clipboard for ink-based notes. A perfect combination. Considering the price and MGF reputation for excellent products, I was very disappointed in the Mini iPad version of this kneeboard. First of all, there is no pencil/stylus holder. 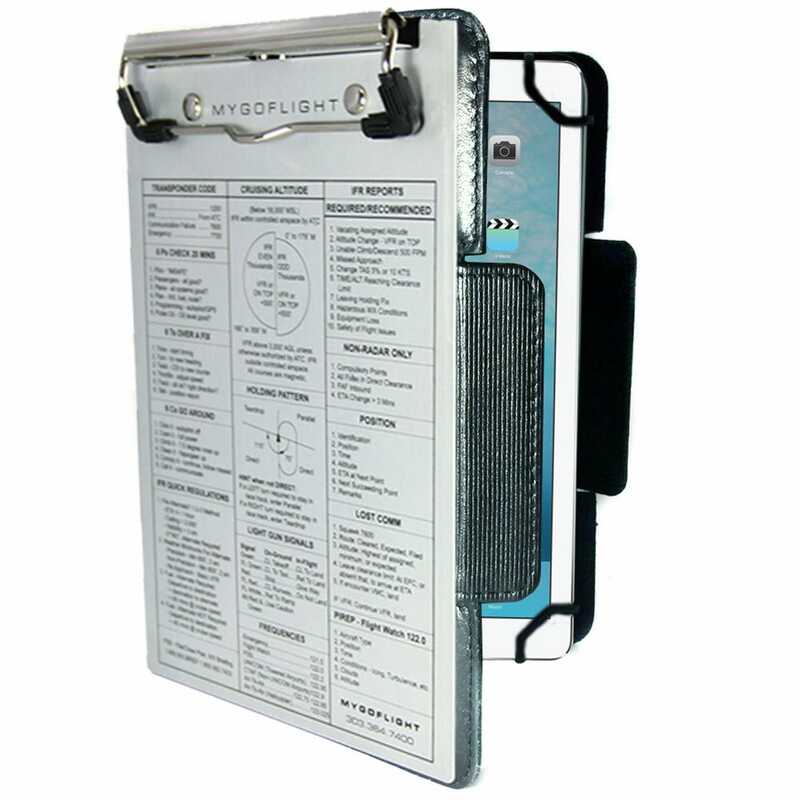 Second, when the clipboard side has a pad of paper, the kneeboard won't completely close. When it is closed (not completely) the clip on the clipboard comes dangerously in contact with the screen of the iPad. Additionally, the plastic corners of the clip come off all of the time and will surely be lost soon. 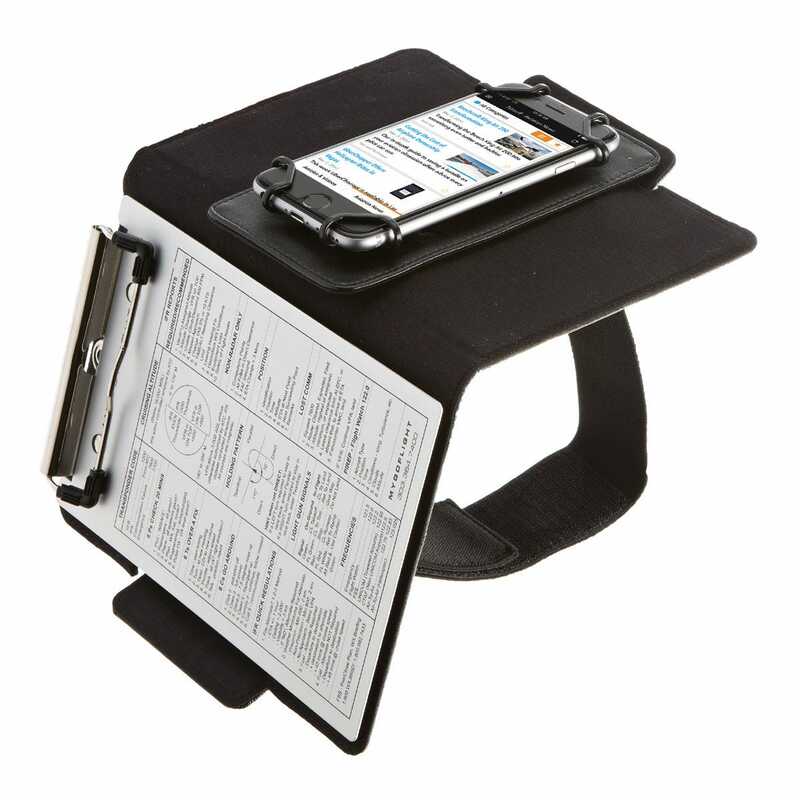 The only saving grace is that the clipboard is detachable and can be placed on the outside cover. It is too big for my lap. It doesn’t fit under the yoke. On the other hand it is well made. Very happy with this kneeboard. 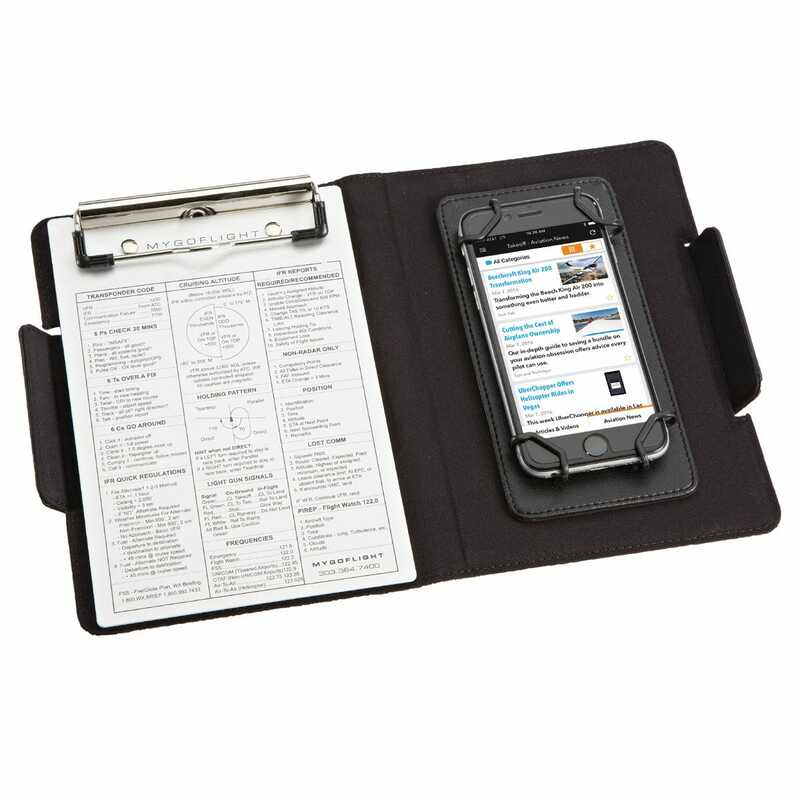 It works great as a protective portfolio case for everyday business, and easily converts to a kneeboard for flight ops. 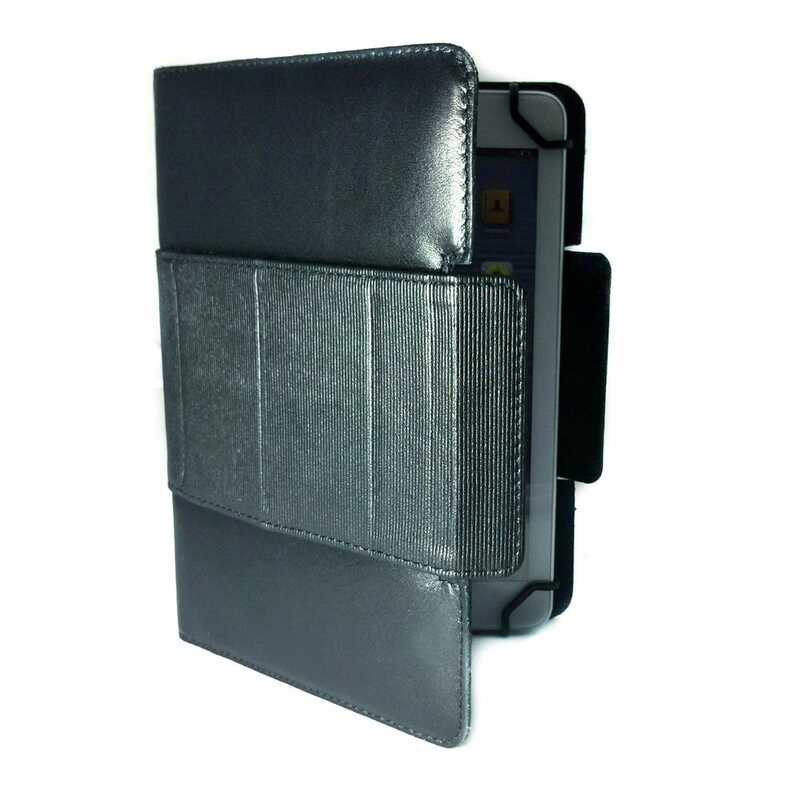 The firm but padded exterior offers decent protection for the iPad, and the magnetic clasp makes it all the better. Worth the investment - Very happy! Does this fit the new 10.5-inch iPad Pro? What option do I select since that is not one of the options. The iPad Air 1-2, iPad 2017, and the newest 9.7" Pro will all fit in the same kneeboard. Some Android tablets with similar dimensions will work too. This kneeboard is also compatible with the New iPad Pro 10.5" but it is a snug fit. I am not sure. 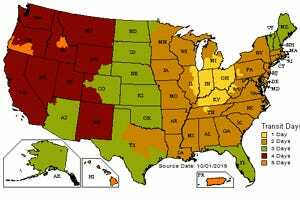 Our products do carry a one year warranty. Does this fit the IPAD 2? BEST ANSWER: Yes, it does. The iPad Mini gen 2/3 work just fine. BEST ANSWER: No, it will not work. We are currently working on a Kansas née oars for the iPad 11. The HP kneeboard will work but will cover the corners of the screen. Thank you. Do you know when the new kneeboard case will be available. Estimated time. I would estimate some time this summer. 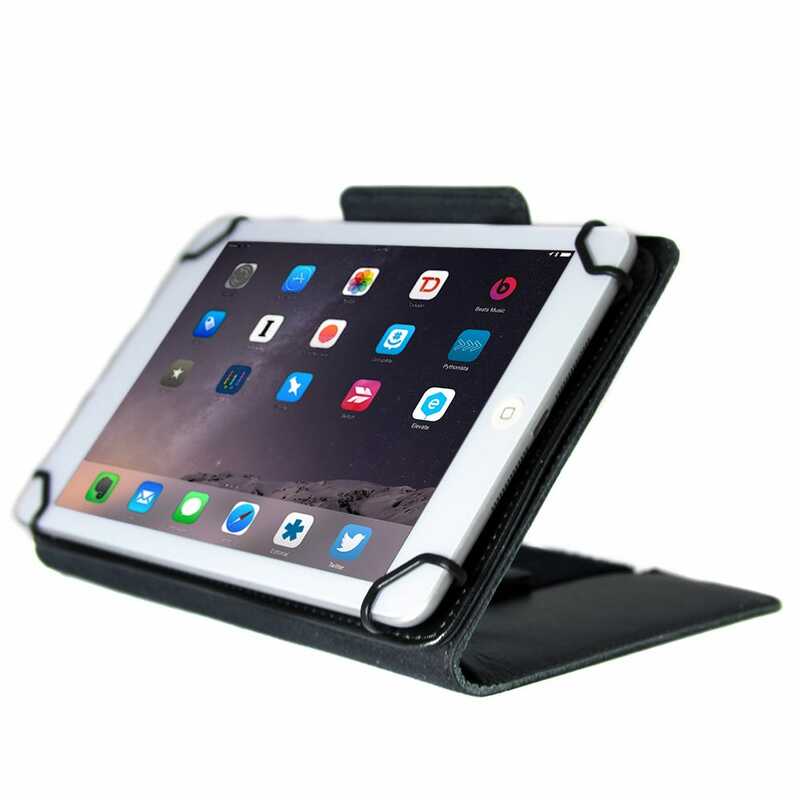 Compatible with IPAD Air 2 in Otterbox case? Ipad air 2. Yes. Otterbox. Probably not. The clips on the corners are not thick enough to take a thick case like the otterbox. However I took mine out of it's case and carry it in the knee board. I use the knee board as the protective case as it's plenty thick and padded enough. 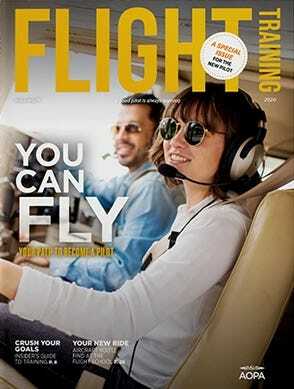 Is this a good case for a IFR student in a part 141 program? Yes I have enjoyed the case when I went through my training. Has good quick references in case you forget something and it's good quality. I'm a VFR pilot but I love the case. Hi. 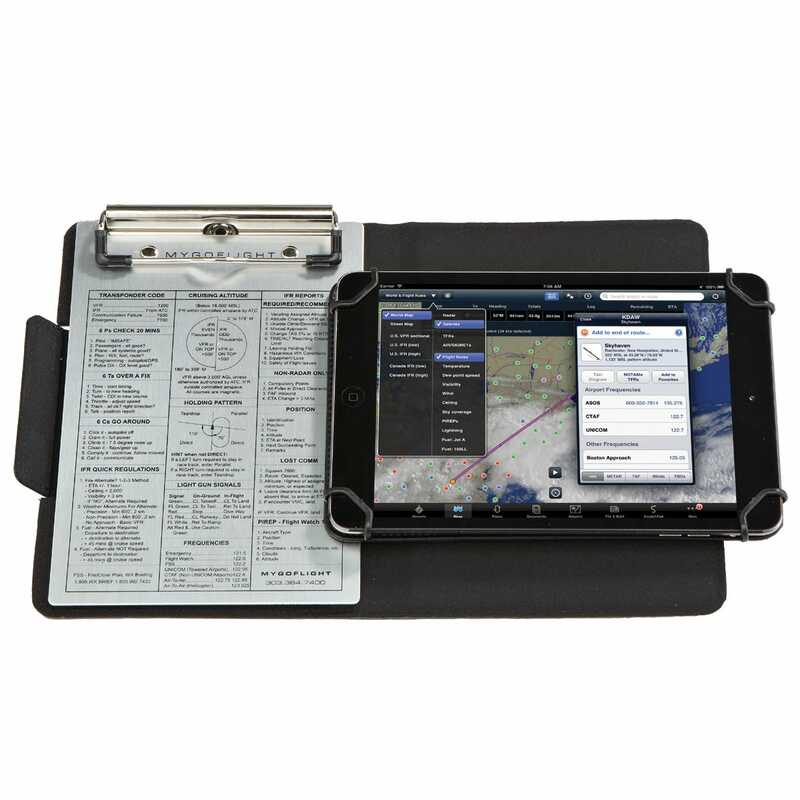 I got the kneeboard for my Ipad Pro 9.7. I plan to get the Ipad Pro 11. Does it fit into my current kneeboard? BEST ANSWER: It will not fit into the kneeboard that you have. We will have a kneeboard that will fit the 11" iPad, please watch our website. Will it hold the 12” iPad? BEST ANSWER: Yes, there is an option for the 12.9 iPad. Does the quick reference chart come with the case? BEST ANSWER: Yes, it is included. I have two questions. 1.Does it fit well for iPad Pro 9.5 2. Does it have a pocket of some sort for pens/pencils? BEST ANSWER: Yes, it fits the iPad Pro 9.7. It does not have any pockets. Does it block the back camera? BEST ANSWER: Yes, the full size version works with the iPad 4. Will an iPad mini 4 with a Lifeproof case fit? BEST ANSWER: No, the Lifeproof is just a little too thick.